Zone LB Man is one of my most balanced pass defense plays. It does well against almost all deep passing plays featuring no more than three receivers, while standing fairly tough against the run by virtue of the three linebackers playing man defense. The linebackers primarily cover the running backs and tight ends, though one will occasionally slide out over a flanker in three wide receiver sets. 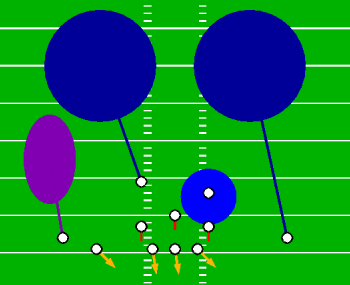 Pressure is added by blitzing the slot cornerback, which is also effective stopping runs to the left side. Zone LB Man shares borrows some characteristics from Speed Quarter - Spin Zone, though with a few twists. The strong safety sits in a relatively short hook zone, rather than the free safety, and the left cornerback drops straight back into a deep zone rather than the right outside CB. This deep zone has proven extremely effective against streaks down the right sideline, despite having only single coverage. Twin streaks to this side may cause some problems, but the free safety would have a chance to help out from his deep zone position if the pass hangs in the air for long. The only real vulnerability to this formation is the short zone under this deep zone along the right sideline, although the linebackers and strong safety are close enough to prevent big runs after a catch. This side is also somewhat vulnerable to running plays if the linebackers get pinched to the inside, so you may want to slide either the line or linebackers to the right side of the offensive formation if the offense lines up a tight end to this side. Even with the CB blitz, Zone LB Man only rushes four defenders. It's tough against the run with three LBs in zone but won't make many tackles for loss. Likewise, it won't get a lot of sacks through pure power, but the CB blitz may cause the quarterback to throw before he wants to, which in turn can generate quite a few picks by the deep zone defenders. All in all Zone LB Man may not be flashy, but it is effective.